My main goal, widening the gullet at the back, turned out to be slightly more complicated. I was attemting to use the existing holes for stitching, but to move the panels themselves. This involved some inventiveness on my part in how exactly I stitched it. I also had to alter the central leather piece--the one that goes over the tree, between the saddles. It was originally folded over and around the panels, covering the center of the edge, where they had some rough areas. When I pulled the panels out, the leather still had to go over the tips of the panels, but it required some manipulation of its shape. I am delighted with the finished product. And the change is not visible from above (I had worried that the panels might extend visibly beyond the edge of the seat). I really hope Kat approves. Well, my saddle tool and supplies came in today. Without them, I had no way to put the Courbette back together, even without making any modifications. So today I got started on putting it all together. Now, this saddle was used when I bought it. Courbette doesn't even make a Futura anymore. I'm not very pleased with the foam panels, but when I was comparing them, I noticed that they're not even even. Well, I don't quite have the experience to entirely remove the foam. I *think* I could take the foam out and replace it with good wool flocking, but I want a little more practice with the flocking itself before I start on a project of that magnitude. In order to remove the foam, I would have to take the panels apart entirely, then put them back together. I need a bit more experience in left-right comparisons before I try to make the panels themselves even. However! These panels, despite their foam interiors, *have* openings to add wool flocking. I noticed this when I first took the saddle apart. What were they planning to do...use a flocking iron to add or take away little foam granules? Heh. But wait...the foam panels aren't even. Not only that, with my horse having such a high. narrow wither, I really could use a *touch* more padding up in front. Hmmm. Hmmm. So I *flocked* it! Over top of the foam. Got a couple of pics, probably will post them with next update. I am pretty happy with the consistency and even-ness of the panels now. I began putting it back together, and after getting about 1/4 done, I noticed it was midnight. I probably should sleep tonight :) I'll get back to this again tomorrow. I am quite cheerful about this saddle overall. Further updates will include more info about how I plan to separate the panels (and progress in action). I've taken a saddle fitting & flocking course. Tremendous amount of information. Among other things, I discovered that my beloved Courbette Futura doesn't fit my horse--and shouldn't go on any horse. 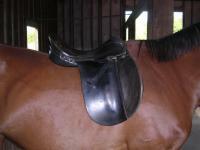 Like many saddles, the gullet is narrower at the back than at the front, and so the saddle sits almost directly on her spine. Armed with my new knowledge in the areas of saddle construction, today I took the saddle apart to see if I could make the fit any better. I am delighted to report that I believe I can! If I run two fingers down her spine, I can feel the panels with those two fingers. Much too close. Some panels can be widened. Some are constructed in such a way as to make it a major pain in the neck. And some are on a tree that would not support the panels being any wider. (If I were going to try to widen the panels on my Kieffer, I think I might consider seppuku instead.) I didn't know what I was going to find with the Courbette, but I love it dearly and am willing to put in a reasonable effort, possibly even an unreasonable effort. As it turns out, the panels would be very simple to move outward. Unlike quite a few of the other saddles we examined, this saddle has panels which are not directly attached to each other. When I stitch the saddle back together, I should be able to separate them an additional distance. The seat of the tree is wide enough that the panels should still be underneath it. The back will require some modification. I'll have to get another piece of leather and use it across the gullet, and I'll have to make it look nice too. More importantly, I'll have to be sure that 1) I set the panels on evenly (you wouldn't believe how many saddles have panels that are offset to the left or right) and 2) make sure that I preserve the balance of the saddle. The center of the saddle, and where I sit when I'm in the saddle, should not change drastically, or else it will become uncomfortable. If I were working with a wool-flocked saddle, the balance could be adjusted as I adjust the separation of the panels. Alas, it's got foam panels. I will be taking another look at those later on to see if it's worth converting it to wool (instructor told us that usually foam panels are glued to the leather, and removing the foam is too much hassle to be worth it). So I'll have to be very careful and see how things go. I will likely have to tack it together briefly, check it out, take it apart, and start over several times before I get it the way I want it. I am very cheered, though, that it looks like I can make my lovely saddle one which I would be happy to put back on my horse. Encouraging.